…because it’s red and green. This is a quick one pan and one pot or oven/toaster oven recipe that would work well in a tiny house or micro apartment or anywhere. I wish I had thought of this in my first apartment. Make rice. I used short grain brown rice. Get the oven going at 375º. Bring 2 1/3 cups of water to a boil. I use a measuring cup in the microwave. In a covered baking dish or use foil, combine 1 1/2 cups rice, 1/2 teaspoon salt, 1 tablespoon olive oil, and the boiling water. Stir. Cover. Bake for 50 minutes. Make sauce. In a measuring cup add a tablespoon of cornstarch. Mix in 1/3 cup soy sauce slowly. Add 1 tablespoon grated ginger, 2 cloves of garlic finely chopped or put through the press, 1 teaspoon curry powder. I use plain old McCormick. Brown around one pound ground beef. I freeze ground beef for dishes like this. I use 90% lean grass-fed. In a large frying pan, add frozen ground beef. On medium high heat, turn and break up with spatula. Meanwhile, back at the cutting board, slice one yellow onion into strips. Add onion when beef is browned. While onion is browning cut red and green pepper into strips. Add peppers to the pan and about a half cup of water. Cover and steam until peppers are how you like them. Work in the sauce for a minute or so, adding water if wanted. I’m thinking about trying this with a butter, worcestershire sauce, and curry over mashed potatoes. 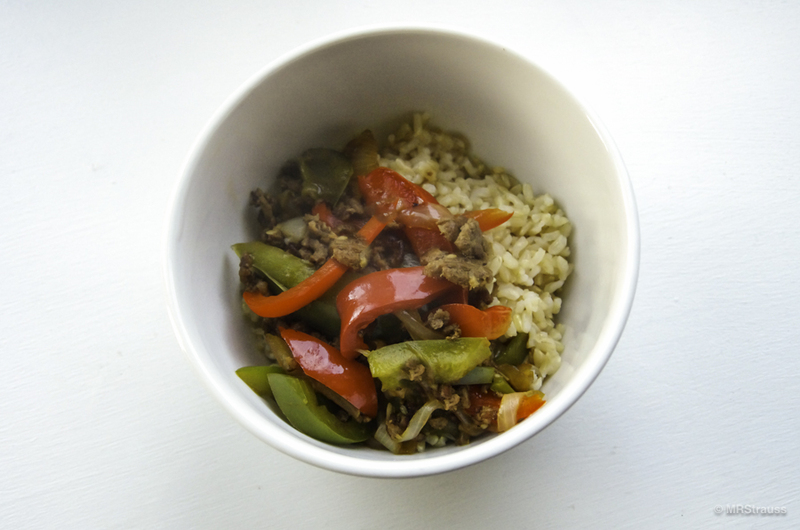 This entry was posted in Bentosh and tagged Hamburger, Onions, Peppers, Short Grain Brown Rice on December 19, 2017 by mrstrauss.